Hi, and welcome to the weekend. It’s going to be a very busy one as all our Cicchetti restaurants are fully booked! Tonight I will be going to London to see all our fantastic customers and maybe even have a little Prosecco with them, as tomorrow I will be visiting Winter Wonderland in Hyde Park London with my children to see Santa. Chefs get asked the same questions around this time of year and it normally involves how to cook a turkey. This week’s book, Christmas, by Gordon Ramsay has the answers plus this alternative lunch. 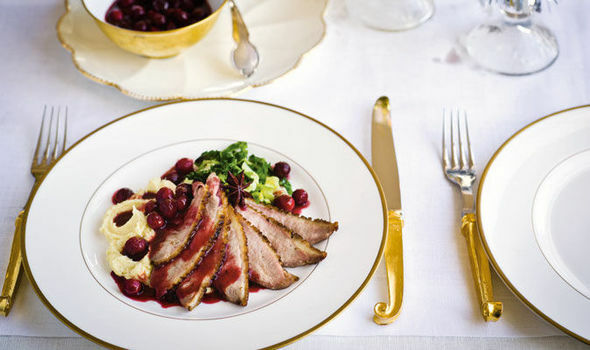 So if you don’t fancy turkey why not try pan-fried duck breast which marries very well with the orange and the cranberry sauce then the Christmas bombe. This is a must buy book for Christmas, full of fabulous recipes. We’ll have some more festive ideas for you next week. Ciao! Lightly score the skins of the duck breasts with a sharp knife. Using a pestle and mortar, grind the juniper berries, caraway seeds, allspice, 1 tsp salt and a few grinds of pepper to a powder. Rub the spice mix all over the duck breasts and leave to stand for about 10 minutes. Lay the duck breasts, skin side down, in a dry heavy-based large frying pan and gradually turn up the heat. Fry for 5-10 minutes, until most of the fat has rendered and the skin is golden brown. Turn the duck breasts over and lightly brown the other side for a couple of minutes, or until they feel slightly springy when pressed. Remove from the pan and leave to rest in a warm place while you make the sauce. For the sauce, pour off excess fat from the frying pan and place over a high heat. Pour in the port, stirring to deglaze, and let it bubble for a minute. Add the remaining ingredients, except the butter, and bring to the boil. Let it bubble until the liquid has reduced by two-thirds and thickened to a syrupy consistency. The cranberries should be very soft; squash a few with a wooden spoon, leaving the others whole. Add any juices from the resting duck. Taste and adjust the seasoning and add a little more jelly if desired. Finally, add the butter and shake the pan to incorporate it as it melts. Slice the duck breasts on the diagonal and fan them out on warmed serving plates. Spoon the sauce around the duck and serve with parsnip purée and creamed cabbage with thyme if you like.